NASA will release new photos of its Apollo moon landing sites on Tuesday (Sept. 6). It will be only the second time that high-resolution views of the lunar landing spots have been collected by a powerful unmanned probe circling the moon. The photos were taken by the Lunar Reconnaissance Orbiter, which has been circling our satellite since June 2009. The same spacecraft captured the first close-up views of the Apollo landing sites from above in July 2009. NASA hasn't said how many photos will be released next week, or which of the six lunar landing sites were imaged — though the images represent three different sites, according to a NASA statement. The agency will release the photos during a press conference at 11:45 a.m. EDT (1545 GMT). The conference will be broadcast live on NASA TV and streamed in a webcast. History buffs hope the new batch of images will help answer some outstanding questions about the Apollo missions, such as whether the American flags planted by the astronauts are still standing, or were knocked down when the lunar modules lifted off for the trip back to Earth. 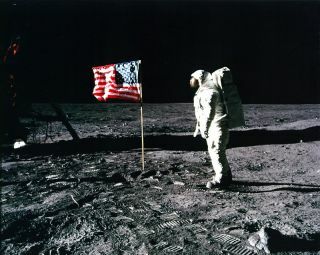 "If we can see a shadow then we might be able to indicate that the flag is still there," Pearlman told SPACE.com. "But the flag is very, very small and the resolution would need to be very high and the lighting would need to be perfect for that to happen." The first Apollo LRO images did provide clues to solve some history mysteries. For example, during the Apollo 14 mission, astronauts Edgar Mitchell and Alan Shepard set off to visit the enticing Cone Crater, but turned around midway through a grueling uphill hike because crater seemed nowhere near and the moonwalkers couldn't be sure of their position. Mitchell and Shepard left the moon never knowing just how close they had come. When LRO looked at the area 38 years later, the astronauts' footprint paths proved they had come just 100 feet (30 meters) from the rim of their target. "In these people's minds, if you can fake a moon landing, you can certainly fake a couple of pictures," Pearlman said. "That’s not the point of this. But it's a nice opportunity they had and I'm glad they took it." Speakers during the Tuesday press conference will include Jim Green, director of the Planetary Science Division at NASA Headquarters in Washington, D.C.; Arizona State University, Tempe scientist Mark Robinson, who is the principal investigator of LRO's camera; and Richard Vondrak, an LRO project scientist at NASA's Goddard Space Flight Center in Greenbelt, Md. The $504 million LRO probe launched in Jun 2009, and is currently on an extended mission through at least September 2012.